Koa had a fortunate start in life — he presented with both front legs back (lethal for both mom and baby if unattended), and Gwen was, as always, at home to monitor his birth and corrected the accidental malpresentation in a timely manner (this is exactly why Gwen works night shift). The bonus for Gwen is that on top of ensuring her buddy Tokatee's wellbeing, it turns out that she also has a new friend in Koa, and what a special friendship that is shaping up to be! Koa has picked Scioty (our other young stud prospect) as his llama buddy, which is handy — these two are our top picks as our next go-to personal packers. Most (virtually all) llama babies spend at least a couple of weeks trying to locate other milk bars, eventually enduring voluminous spit from other adult llamas and age-appropriate correction from us. Koa hasn't even considered pursuing such a pointless activity — if it doesn't smell like milk, it simply doesn't have any. We're impressed. Koa is definitely a thinker! This has proven to be only the tip of the iceberg — Koa continues to blow our minds with his ability to stay in "thought gear" in situations when any other llama would "flip the switch" to reaction. Koa's gaits are strong and true — a natural trot and four-beat walk (a huge improvement over his sire's) — and because he's inherited the highly desirable standard Classic coat only through Credo (mom's Classic coat is mid-length), it is certain that he did not inherit the longer-coat and associated crossbred traits that his sire unavoidably carries in his genes from Sky Rocket. Additionally, Koa does not have any shred of the aggression and "entitlement complex" that his sire and especially grandsire Sky Rocket have, but rather exudes the calmness, cooperative bent, interactivity, and level head of his dam and particularly grandsire Ranger Dusty — Koa shows every indication that he indeed has that sensible, easily-managed, genuine old-style Classic llama disposition. With all that in his package, Koa is definitely the upgrade from Credo we'd been hoping for — actually well beyond what we dared to hope for in any one individual — and it's a no-brainer for us to keep Koa as one of our "inner circle" (no outside breedings) pack studs. Although half-sister Toiyabe was born with partial choanal atresia, our evidence (and that of others) is now pointing to a specific teratogen administered within a specific critical window of gestation rather than a purely hereditary cause. We are confident in our evidence, or we would not have even considered breeding Tokatee again. However, we've agreed that because our knowledge is not infallible, should Koa indeed make the grade as a stud for us, he still will NOT be available for outside breedings nor will his offspring be sold as breeding stock — NO exceptions. All that is quite a bit to say about any llama, let alone about one for whom this was true at less than two years old. Yet, on top of all that, Koa also managed the near-impossible — creating a bond with Gwen already strong enough to ease the intense void left by Dusty and Logan. 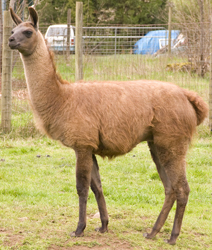 So whether Koa continues on the path of pack stud or not, his forever home is right here at Lost Creek Llamas. Koa is a tree in the acacia family, endemic to Hawaii. It is unique in many ways, including being nontoxic (having evolved in the absence of large herbivores). The word "koa" is native hawai'ian and means "strong", which Koa definitely embodies.